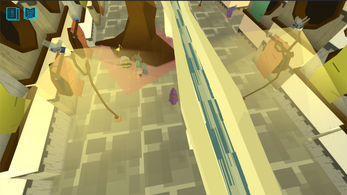 Lingotopia is a language learning game about the feeling of being lost in a city where you don't speak the language. ist eventuell auch die thailändische Sprache geplant? It´s possible to get this game for thai language and with german translation some day? I just tried out the demo and I love it! I can see that you have obviously put a lot of work and effort into this game and I can't wait to see where it goes! I love the dictionary that generates with the words I have already learned! It is very helpful! I also liked the ability to use it to show progress! I would open it periodically and was always shocked that I had learned more words than I thought. I love that you marked which characters had dialogue in the game so I wasn't just randomly clicking on people. I love the diversity of languages available! I love how fun this is and it is definitely something I would encourage teachers and friends to look into. The learning potential from this is amazing and I could see it being useful for all ages! I disliked how the camera moved. I was getting dizzy with all of the spinning and I wish the camera was more stable or had an option that could make it stable. I disliked how you have to click to move. I would prefer using the keyboard to move and I think it would be helpful to have the dictionary as a hot key in case someone wanted to look up a word. I would like to see an intro or journal or quest log that would help guide characters along towards the end goal of the game. I also would love a map in the corner so I can see where I am going and where I have been. I know you are hard at work making this game come to life so I hope my feedback helps and I wish you luck and support! Hi Tristan! 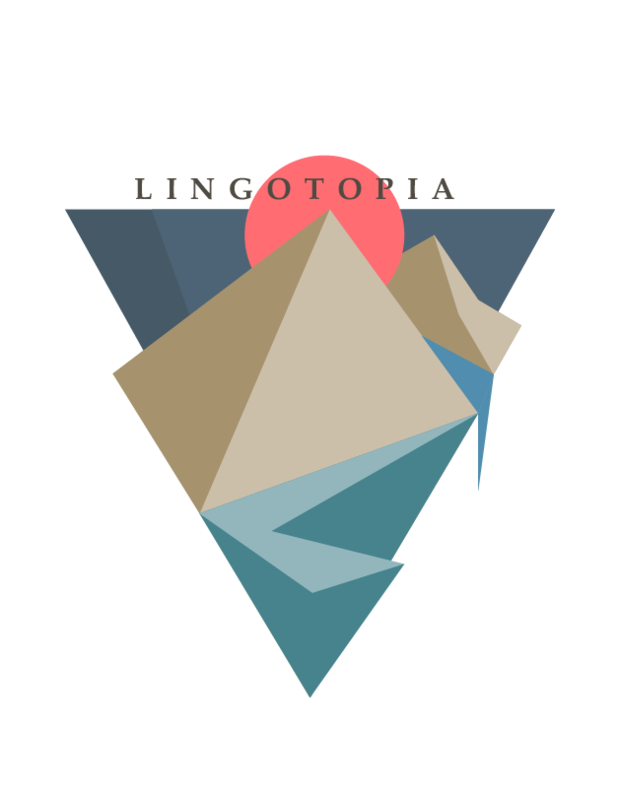 I tried the demo for Lingotopia after the Kickstarter got my interest . I have a few suggestions I think could improve the game. First, it would be nice to have the options to use WASD when walking around in the game, mostly because the walking + the click sound gets annoying after awhile. Second, I wish after you clicked on a object to learn the translated terms that you can not click on the object again. It was a problem when I tried to go up the stairs and it kept showing the translation or when I accidentally clicked on objects I already knew about. 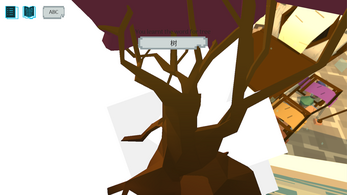 I think the dictionary would be enough to let the player remember the terms. This seems to be a really exciting, I wish there was an option to learn Polish! I feel like the gameplay is rough on the edges and could use some work. Finding the people who are going to speak with me are just a little bit too far away to ensure perfect engagement to the game. One thing I'd like to see out of this game in the future is for some kind of story based element to it. Think of it like this - you are lost in the city and find someone willing to take you in to help you around and get your footing in communicating with the locals. They bring you in and treat you as their own while showing you various items and telling you what they mean as well as connections to other things and verb conjugations. Think of a section in the living room of a house where the guy shows you his family and runs down the various verb conjugations for, say, hablar, using you and his family and people-props to demonstrate. This has lots of potential, keep at it! 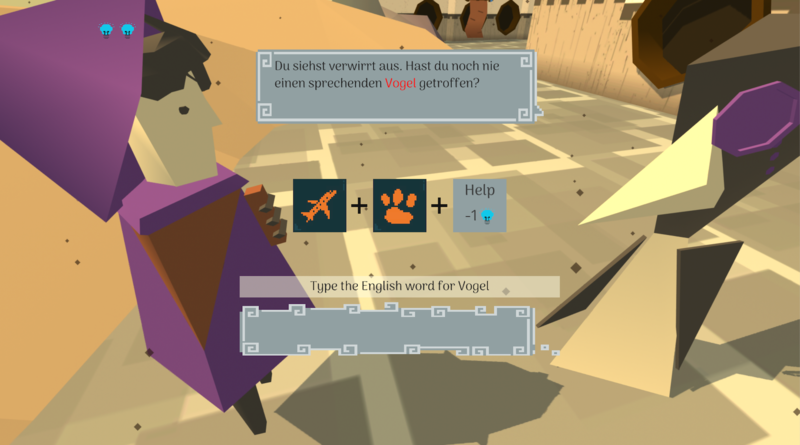 We, at gamesforlaguage.com are interested in games for language learning. We'll be in interested in your progress , will try your game, and provide some feedback! The seed for what could be a great game, for sure. 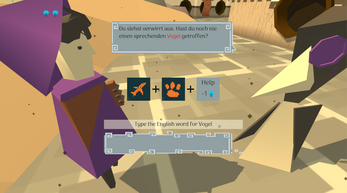 There's not much actual language learning yet, since other than clicking on selected items, there's not a lot of context for the words you learn. Hopefully that's something that gets added at some point as you get the mechanics solidified and start deepening the NPC interactions. I managed to get outside the town through a gap near the sailboats, onto a largely empty plain. I absolutely love the concept of this game. But, I feel as if it's a mile wide and an inch deep. Let me explain. Your world is massive, which is a good thing if there is things to do everywhere, but in my (short) amount of time playing this game, I found very few npc's that are willing to talk to me. I do enjoy the idea of exploring and finding people to talk to, I just wish it was a bit more dense. The only other thing is the camera. It clips into objects and can kinda be a pain. I also wish I could control the camera to look around to try and find the npc's. If you do these things, and of course add a bit more polish, I could see this game as a legitimate educational tool that is very fun. Best of luck to your development! Cheers! 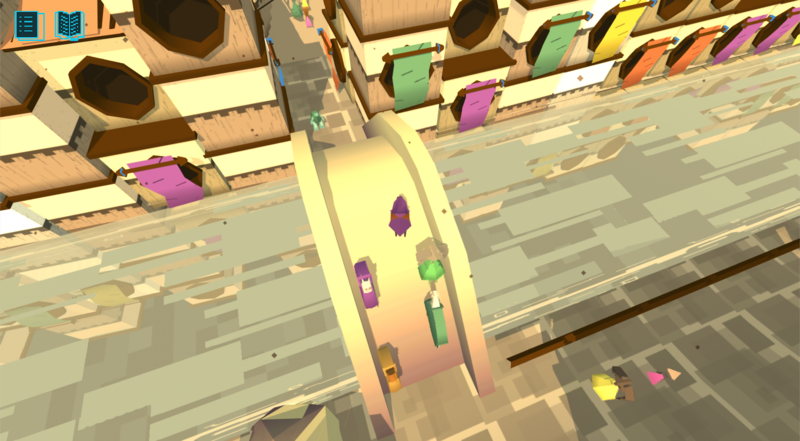 This is a really fun game with a really good concept. I love that this is a way to learn new words from many different languages and I really think you've created something special. Hopefully my video on your game will get more people to see it and will help you get more people to translate things. I wish you well in the games development and hope I helped. This looks like a really cool game concept! I think it's failry obvious that this game is still in its infancy, but I think this could be a great educational tool because it lets the user set their pace. Awesome game! I made a Hungarian translation for you! :) I am exciting to the whole story to play. Can't wait to see :D Nice Work! really nice! what is the license? do you plan to use some free software license, to allow collaborators to get into the project? what technologies and tools are you using for development? This game has great potential. I'm not sure how I feel about the "ding" sound every time I click to move. It was cute then progressively got annoying. Maybe there could be an option to keep moving while the mouse is held down or move with the keyboard? When asking the player to type a word, explicitly state you want the English word ... during my first try I lost all my hearts from typing the word to be translated instead of the English translation.